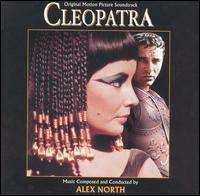 The soundtrack of Cleopatra was composed by Alex North and was recorded and produced in 1963. This article focuses on the remastered, digital-era re-releases of the soundtrack, rather than the initial vinyl selection of pieces from the score. The limited edition 1997 Tsunami Records (an independent German record label) release, which contained selected tracks, not representing the complete range of tracks heard in the film. The Tsunami release is also considered to be of an inferior sound quality and was made redundant by the complete Varèse Sarabande release. The 2001 Varèse Sarabande album, by far the most popular release of the soundtrack of Cleopatra. Running over 151 minutes, the album contains the entire score heard in the film in chronological order. It was released over two discs. Cover for the 2001 Varèse Sarabande release. The film was nominated for a Best Picture Academy Award. On the site Filmtracks.com, the soundtrack is rated 5/5. Allmusic rates the soundtrack 4.5/5. 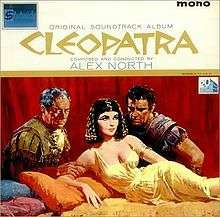 1 2 3 "Filmtracks: Cleopatra (Alex North)". Filmtracks. March 24, 2001. Retrieved January 13, 2012.